Manipur Revenue, Consumers affairs Food & Public Distribution Minister Karam Shyam on Monday said right usage of language and good words play a major role in winning hearts, particularly during adolescence period and even convincing the people in politics. 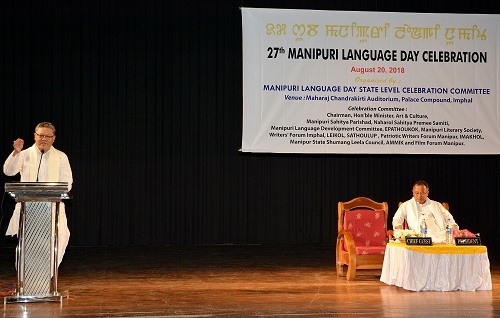 He was speaking at the 27th Manipuri Language Day. The programme was held under the aegis of a state level celebrating committee which include Manipuri Sahitya Parishad, Naharol Sahitya Premee Samiti, Manipuri Language Development Committee, Epathoukok, Manipuri Literary Society, Writers Forum Imphal, Leikol, Sathoulup, Patriotic Writers Forum Manipur, Imakhol, Manipur State Shumang Leela Council, Ammik and Film Forum Manipur at Maharaj Chandrakirti Auditorium in Imphal. Pointing out that the citizens of the developed nations such as China, Japan, Germany & France are enjoying a sense of pride and identity by using their native languages more in public, Shyam also appreciated the 13 committees who are working under a single roof to celebrate the Manipuri Language Day and influenced by the common theme to take the state forward with a sense of unity. He also emphasized the need to co-ordinate and analyze the errors, weaknesses and faults in our language rather than blaming each other. He added all bundles of emotions whether-joy or sorrow, love-hatred, anger or jealousy can be expressed by using proper choice of words from the total set of language. “We should try to find out why our language is still not included in the currency notes,” he said. Most of the speakers in the day’s gathering pointed out that more finance is needed in the budget for language development. Minister Jayentakumar also spoke on the occasion wherein one minute silence was also observed as a tribute to the late former Prime Minister Atal Bihari Vajpayee. There are also reports of observing the Manipuri Language Day at other parts of state including at DM College of Arts and All Manipur Students’ Union office in Imphal.